Daily Messes: What A Crock! 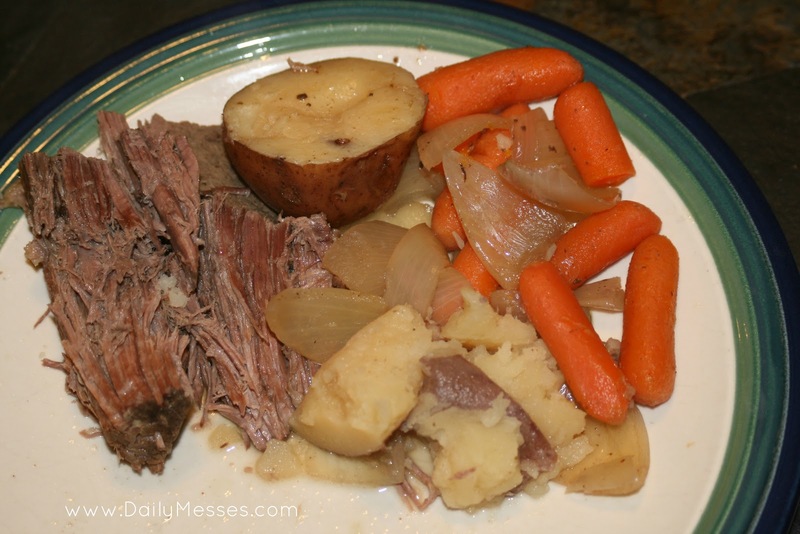 Of Pot Roast, That Is! What A Crock! Of Pot Roast, That Is! If you need a super easy, yet tasty dinner, try making a roast in the crock pot! It takes 7-8 hours to cook, so it's great to start in the morning and not have to worry about making dinner later. Total time from prep to finish is 7 hours 15 minutes to 8 hours 15 minutes (depending on roast and crock pot heat). 1. Spray the crock pot with non-stick spray. 2. Place roast in crock pot and pour soda over. 3. Cut onions into wedges and place in crock pot. 4. Place carrots into pot. If using large carrots, peel and cut into large pieces before placing in crock pot. 5. Wash and quarter potatoes. Place in crock pot. 6. Cook on low heat for 7-8 hours. 7. Halfway through cooking, check liquid levels. If needed, add water. 8. If you want to add green beans, place in crock pot during last half hour of cooking so they are not over done!